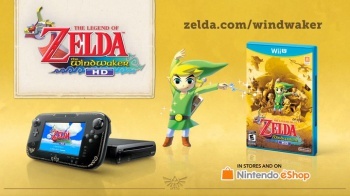 The bundle will come with a Zelda-themed Wii U. It's looking more and more like that $350 Wind Waker HD Wii U bundle Destructoid dug up earlier is going to be a reality, with Polygon discovering an interesting image in the recently released Hero Mode trailer, showing off what certainly appears to be a Zelda-themed Wii U console. The Hero Mode trailer was only up briefly, as Nintendo quickly pulled it when it realized it preemptively spilled the beans on the new special edition Wii U console. It was re-hosted by a Neogaf user, but now that video also appears to have been taken down. Luckily, we do have a screencap of the supposed console, which you can check out above. The image shows a black Wii U GamePad with Legend of Zelda styling, looking very similar to the limited edition 25th anniversary Legend of Zelda 3DS Europe got a couple years ago. Destructoid originally reported that the Winder Waker HD bundle would set you back $349.99, and include 32GB Deluxe version of the console. They also reported that $200 red and blue 3DS XLs bundled with Pokemon X and Y would be hitting store shelves in October. We have contacted Nintendo for official confirmation of the bundle, but the evidence suggests that this is most likely a reality. Is a Zelda-themed console bundle enough to get you to buy a Wii U? Personally, I'm waiting for both a price drop and Smash Bros. before I'd consider getting one, but i'm sure Zelda fans would go crazy for this.